We picked this candy up at the Sweets and Snacks Expo 2011. I had two packages of them so I tried a few on my way home from Chicago. It was a five hour drive and I do have a love of tic tacs. Besides, I didn't want to eat much else after two days of "sweets and snacks", so a 2 calorie mint was exactly what I wanted. At the time I thought this candy was amazing and absolutely loved it, but as I tried a few today my initial thoughts were swayed a bit. First, here's my story about tic tacs. I remember when I was little an older gentlemen who attended our church. He always sat in the back to open and close the middle doors. I believe he was the "Head Usher", but I remember him as Mr. P. After church was over, he would always wink at you and say he was "watching you behave in church" and would then take a container of tic tacs out of his pocket and let you have one. 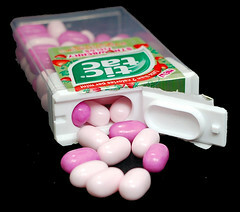 These tiny little mints were like manna from Heaven. I don't know why that was such a big deal but he was always such a nice person and ALWAYS had tic tacs with him. My favorite was the orange flavored. I remember sometimes he'd take out a white mint box and then he would smile at me as from another secret pocket he would produce an orange box just for me. Maybe he was that nice to everyone, but at the time, I thought he was the nicest person I'd ever met. As time went on and I got older I couldn't help myself to the candy after church but my brother and sister could. They had the same smile and reaction as I did and we sometimes talk about Mr. P. and just how nice that one act really was. Fast forward to today and I still love tic tacs, maybe because of Mr. P. Orange is still my favorite, but I love to try their new flavors. I really like this flavor, but I started out loving it. I'm not sure why I changed my mind but initially I thought these were fantastic, then I decided they were good but wouldn't unseat my favorite orange tic tac from being the king of tic tac flavor hill. These have a very nice strawberry flavor that takes just a second to hit your tongue. I think there are two different flavors in each container and I keep pairing them up. The brighter pink colored tic tac has more flavor than the lighter color one. It is more pronounced and the lighter pink seemed more soothing to me. It's sort of like a strawberries and cream type flavor. There is also a hint of mint in these but they are not as refreshing as a mint tic tac would be. I like the newer larger size, which is still only 2 calories and I love the "new" in the corner (it always gets my attention when buying candy) and the strawberries graphic floating on the side of the box is a nice touch. 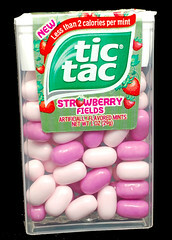 These should hit stores soon and if you are a tic tac fan like me, you'll want to try this flavor out. It is very summery and light and a fun change of pace for a tic tac fan. Price: Free sample from Ferrero U.S.A.